Savory And Sweet: A Taste For Infertility : Shots - Health News The same genes that allow humans to sense sweet and umami flavors may play a key role in a man's reproductive fitness. Researchers found that inactivating these genes in mice can led to sterility of males. 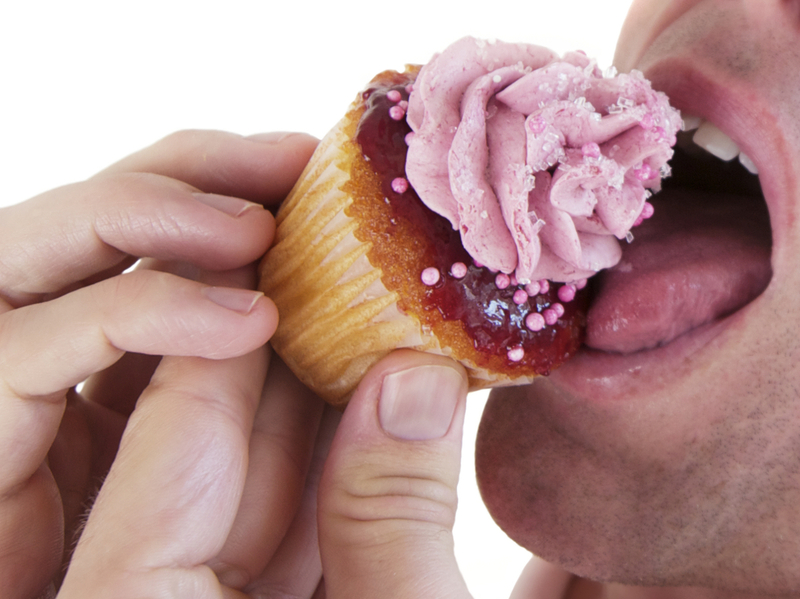 The same genes that makes this cupcake taste so sweet could also play a role in his fertility. Humans have long relied on the sense of taste in the struggle to survive and multiply. A bitter taste alerts us to a plant that may be poisonous. A sweet taste tells us that a plant is likely high in calories and can help sustain us. Our sense of taste may be even more closely linked to the propagation of the human race than we ever suspected. Some of the same genes that allow us to sense sweet and umami flavors are also active in a man's testes and sperm. According to a study published in Proceedings of the National Academy of Sciences Tuesday, suppressing these genes may affect not only his ability to taste but also his ability to reproduce. When food touches our tongue it activates taste receptors which deploy proteins into our nervous system and alert our brain to the flavors. "The taste receptor is like a microphone, and the protein is the microphone cable," says geneticist Bedrich Mosinger, who specializes in the science of taste. "Experiencing a taste is like hearing a sound through an amp," he tells Shots. "If you lose either the mic or the cable, it won't work." In this case, the microphone is the taste receptor controlled by the gene TAS1R, and the cable is a protein called gustducin that is expressed by the gene GNAT3. Mosinger and his team at the Monell Chemical Senses Center in Philadelphia were exploring the specific role of these genes when they discovered something unusual. Curious to see what would happen if the genetic microphone and cable were both removed, they inactivated the genes in some mice. Then they let them mate. Nothing happened. It turned out the male mice were sterile. The result surprised Mosinger. "We wanted an animal with both genes inactivated," he says. "We didn't expect to find much, and we certainly didn't expect these genes to have such a fundamental role in male reproduction." Too bad for the mice. But what does the finding mean for humans? "There is a worldwide decline in male fertility," Mosinger says. "Sperm count and sperm function are going down, and getting progressively worse. We speculate that there is something in the environment causing this." In support of this hypothesis, Mosinger points to a class of drugs called fibrates, used to treat high cholesterol, which are known to block expression of the gene TAS1R. Also, some herbicides are known to have the same effect. If a man who was already dusting his crops with phenoxy herbicides were to become exposed to a substance that inhibits the GNAT3 gene, it could be bad news for his sperm. How likely is that? Shots called human geneticist Dennis Drayna of the National Institutes of Health to find out. "We don't know of any environmental things that contribute to the function of gustducin or GNAT3," he says. "We don't even know if there is any evidence for the existence of such things." So it's not clear if the findings will help us understand male infertility. "The real power of science is surprises like this," Drayna says. "This is another example of how basic biomedical research produces surprises that open our eyes to new and interesting areas of biology that were previously completely unrecognized." Monell's Mosinger pointed out a provocative possibility raised by the findings. "The inhibitors that we found are specific to humans, but with a little more work we could find rodent specific inhibitors for these genes," he says. With still more work, he says, the inhibitors might find use as a better mousetrap: rodent birth control.